What do you think about the hypothesis that globalization makes a "strong" economy the hostage of its own success? What do I mean by that?. Two countries deal with each other for a long time. One of them ("A") has very strong economy - it is very influential, has solid economic fundamentals, exports lots of goods, generates innovations, etc. The second one ("B") is struggling with some economic problems and starting to become more radical, autocratic and populistic. Then "B" demands that "A" (and any other strong countries) must listen him as he is "too big" to collapse and keeps the region "safe" - and can generally do whatever he wants and nobody can do anything to stop it, in his goals and independence. "B" says that any "bad behavior" of "A" (and any other strong countries) may start the next global crisis (immigration increase, debt problems, military conflicts, etc.). As "A" wants to keep its economy rising and reduce any chances of problems, it seems that "B" has started to dictate the rules. P.S. Both countries have similar sizes, GDP per capita ratio are around 4:1 (A:B). As a sheepish form of answer, what is known reasonably well is that globalization affected the middle class of rich countries with stagnation while their top 1% kept gaining (so globalization deferentially affected the society in rich countries). And globalization also allowed the emerging economies to emerge a stronger middle class of their own. That's a prettified version of the graph with some self-explanatory info added by a think tank. For the original curve and explanation see the actual World Bank blog of Milanovic. 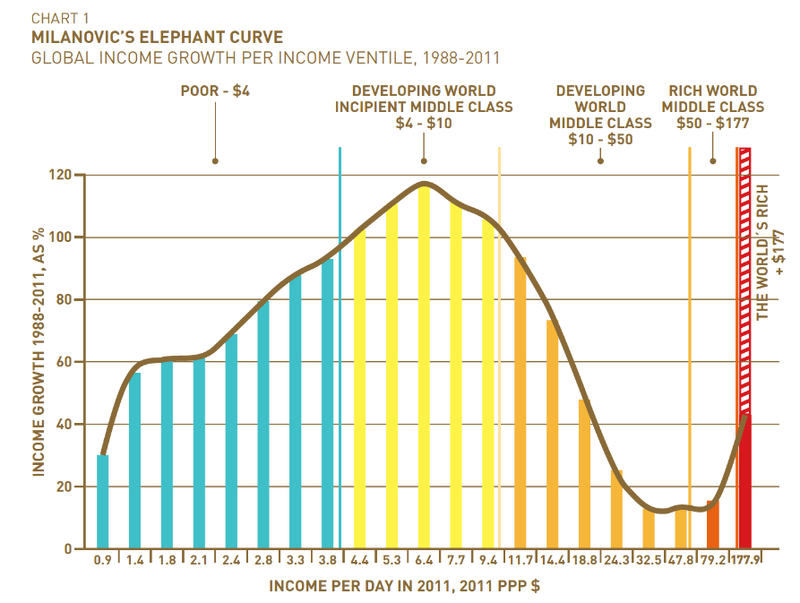 Note that Milanovic has written book in the meantime "Global Inequality. A New Approach for the Age of Globalization", Harvard University Press, 2016. This is seen as the (current) challenge of globalization, aptly put in the title of a 2018 paper "A globalisation challenge: preventing a clash between the middle classes of the developed and emerging economies"
When you speak of the advanced economies being "hostage", I'm guessing you had something like that in mind, not mere GDP growth. It's uncontested that in terms of GDP growth globalization has benefited both the advanced and emerging economies. Lower-skilled workers in advanced economies are at a disadvantage because the comparative advantage in these countries has shifted. These nations now have a comparative advantage only in industries that require workers to have more education and to be flexible and adaptable to changes in the global marketplace. B is in fact blackmailing A. If A concedes to blackmail, A becomes weak on the international scene and an easy target for more blackmail by B and other countries. A doesn't have an end game strategy since B would be encouraged to ask for more. This implies that the cost of accepting B's demands is unknown, as opposed to the cost of refusing it, i.e. taking a loss and ending it there. The autocratic governance of B suggests political instability and probably violence sooner or later. Accepting B's demands can only make it worse: with time and resources, B will become militarily more powerful, more aggressive against its neighbours or its own population. On the contrary, this makes it easier for A to isolate B on the international scene, especially if B is militarily aggressive. In my opinion, this scenario is a clear illustration of the need for long term political vision to sometimes take precedence over short term economics. Also the scenario here is a bit simplistic: in reality A would have a range of options between accepting B's demands and refusing them. Not the answer you're looking for? Browse other questions tagged economy international-relations or ask your own question. Is anti-corruption initiative 'sometimes' detrimental to the economy?